Although the Habsburg dynasty became especially prominent after the election of Rudolf of Habsburg as king of the Romans in 1273, its history goes back to the 10th century. Emperor Otto I (936–973) had a subject named Guntram the Rich (c. 930–990), who was grandfather of Radbot of Klettgau (c. 985–1035). The latter built the castle of Habichtsburg, or the Hawk’s Castle, in the Swiss canton Aargau. One son, Werner I (c. 1030–1096), was styled count of Habsburg, while his other son, Otto I, became count of Sundgau. Werner’s son Otto II (c. 1040–1111) was the first to use the title Habsburg. The wealthy Habsburg dynasty acquired vast territories in German-speaking parts of modern Switzerland, southeast Germany, Alsace, and Austria. This expansion became visible especially during the days of Albrecht III the Rich (d. 1199). 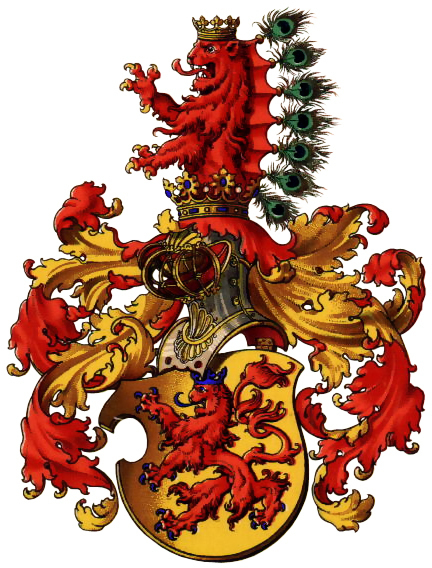 After his death, the House of Habsburg was inherited by Albrecht IV (c. 1239), father of Rudolf, the future King Rudolf I.
Rudolf was born on May 1, 1218, from the union of Albrecht IV of Habsburg and Hedwig of Kyburg. His godfather was Emperor Frederick II Hohenstaufen (1212–1250). When Albrecht died in 1239, Rudolf inherited his holdings in Alsace and six years later (1245) he married Gertrude, daughter of the count of Hohenberg. Gertrude brought a large dowry, which expanded the dominions of the Habsburgs. Rudolf was on excellent terms with Emperor Frederick II and his son Conrad IV (1250–1254), which allowed him to receive a series of imperial grants to augment his estates. This expansion continued during the Interregnum (1254–73), especially after the death of Rudolf’s maternal uncle Hartmann VI of Kyburg (1264). His prominence, wealth, and influence made him a worthy candidate for the royal crown and on September 29, 1273, the assembly of German princes, the Kurfürsten, elected him king of the Romans. Although he was never crowned emperor by the pope in Rome, Pope Gregory X recognized his election, provided that Rudolf renounced all his territorial claims in Rome, Sicily, and the Papal States in Italy. Alfonso X of Castile followed Gregory, elected king of the Romans in 1257. While Rudolf’s coronation did not seem to provoke negative emotions outside his kingdom, the first challenger to his rule came from inside. It was Otokar II, king of Bohemia, who failed to win the majority of the Kurfürsten electors to be crowned the king of the Romans. He refused to acknowledge Rudolf’s election and to surrender his estates in Austria, Carniola, Styria, and Carinthia that were seized from the imperial crown during the Interregnum. The provinces were won back after Otokar’s defeat in 1276. Otokar resumed his hostilities against Rudolf, having allied himself with Polish chieftains. His attempts to challenge Rudolf were crushed in 1278, when he was killed in the Battle of Dürnkrut and Jedenspeigen. Rudolf spent much time restoring domestic peace. He invested two of his sons, Rudolf II (1271–90) and Albrecht I (1255–1308), as counts of Austria and Styria. With the death of Rudolf II in 1290, Albrecht became the sole male heir to the throne. During his brief reign (1291–98) Adolf did not achieve anything significant and in the later years of his rule some German magnates rebelled against him and chose Albrecht as their new king. Albrecht marched with his army against Adolf, who did not recognize the election, and defeated him in the Battle of Göllnheim (July 2, 1298). The throne was restored to the Habsburgs—but only for a short time. The marriage of Albrecht to Elizabeth, daughter and heiress of the count of Gorizia and Tyrol, augmented the demesnes of the Habsburgs. During his reign (1298–1308), Albrecht attempted to seize territories in the Low Countries, as well as on the Burgundian frontier. These attempts to expand his control westward provoked a quarrel with Philip IV of France. After Albrecht’s murder (May 1, 1308), Henry VII of Luxembourg was elected as the new king of the Romans (1308–13), while Albrecht’s heirs were deprived of the crown. His eldest surviving son, Frederick I (1286–1330), tried to regain the royal title at the cost of war against emperors Henry VII (1308–13) and Louis IV (1314–28). In 1322 Louis crushed Frederick’s army in the Battle of Mühldorf, with the latter taken captive. He was released in 1325 and made coruler with Louis. The year after, he withdrew from the joint rule of the empire and came back to rule Austria proper, until his death in 1330. During his struggle with the emperors, Frederick was strongly supported by his younger brother, Leopold (1296–1326), ruler of Farther Austria. The latter insisted on having Frederick crowned as king of the Romans and fought by his side in Mühldorf. Frederick I’s two sons, Albrecht II the Wise (1298–1358) and Otto the Merry, succeeded him in 1330. Although not a monarch, Albrecht gained considerable influence on the international scale. He was asked by Pope Benedict XII and Philip VI of France to mediate in their conflict with the emperor. He never switched allegiences and remained with Louis until the latter’s death in 1346. In domestic matters, Albrecht paid much attention to the law, codifying the rules of inheritance of the Habsburg lands in Austria and issuing constitutions for Styria and Carniola. Frederick’s son Rudolf IV the Founder (1339–65) was married to Catherine of Bohemia, daughter of Emperor Charles IV (1346–78). Rudolf paid a good deal of attention to the development of his hometown, Vienna, where the bishopric and cathedral of St. Stephen were established. In 1365 the University of Vienna was founded, in a response to the establishment of the Charles University of Prague (1348). In 1363 he inherited Tyrol from the childless Countess Margaret of Tyrol and annexed the county to the Habsburg domain. He is also credited with the establishment of a stable currency, the Vienna penny, and the invention of the title archduke of Austria. Rudolf’s son, Albrecht III (1349–95) continued the expansion of the University of Vienna. In 1379, rule over the Habsburg territories was divided between Albrecht and his only surviving brother, Leopold III (1351–86). The former retained Austria, while the latter received Farther Austria, Tyrol, Carinthia, and Styria. He also acquired Freiburg (1386), Feldkirch (1375), and Trieste (1382). After the death of his son, William the Ambitious (1370–1406), the possessions of the Leopoldian line of the Habsburgs were divided between William’s younger brother Ernest the Iron (1377–1424), who inherited Styria, Carinthia, and Carniola, and William’s son Frederick IV (1382–1439), who succeeded in Tyrol and Further Austria. Albrecht V (1397–1439), the future King Albrecht II (1438–39), succeeded the Habsburg dukedom after the death of Albrecht III’s son Albrecht IV (1377–1404). He spent his youth in the company of Emperor Sigismund, who was also king of Hungary and Bohemia and fought by his side against the Hussites of Bohemia. In 1422 he married Sigismund’s daughter Elizabeth, who descended from noble Hungarian and Slavic lines. After Sigismund’s death in 1437, he inherited the kingdom of Hungary and Bohemia, although he was not able to gain control over the latter. In March 1438 he was elected king of the Romans, returning the German crown to the Habsburgs. Having being crowned king, Albrecht spent the last two years of his life fighting Bohemians and Poles, as well as defending Hungary from the Ottoman Turks. Frederick V of Austria, son of Ernest the Iron, succeeded Albrecht as Frederick III (1440–93). He was unsuccessful in battle, but an outstanding diplomat. He signed the Vienna Concordat in 1446, which established and defined relations between the the empire and papacy. In 1452 he was crowned emperor by the pope in Rome. In the same year he married Eleanor of Portugal, inheriting a considerable dowry. In 1475 he arranged the marriage of Mary, daughter of Charles Bold of Burgundy, to his son Maximilian. Despite all these achievements, his rivals challenged Frederick’s power more than once. Between 1458 and 1463 Frederick was involved in a bitter struggle with his brother, Albrecht VI, over Austria. He also fought with his nephew, Ladislaus Posthumus, over Bohemia and Hungary. But the main threat came after Ladislaus’s death, with the ascension of Matthias Corvinus (1458–90) to the Hungarian throne. 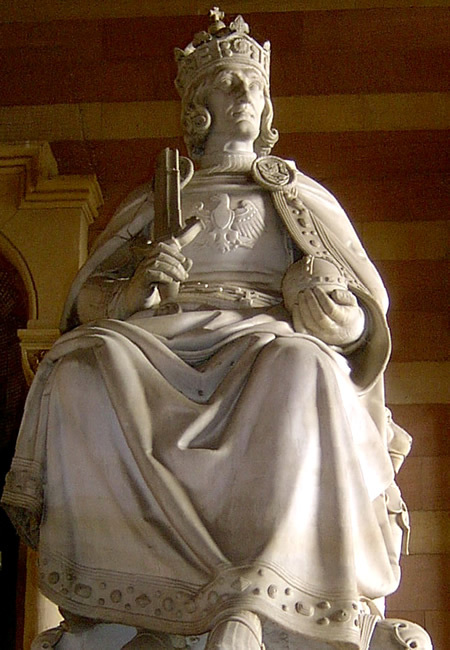 This powerful king seized various Habsburg possessions in Austria, Moravia, and Silesia. In 1485 Corvinus captured Vienna and resided there until his death in 1490. It was only his death that saved Frederick’s rule and perhaps the imperial rule of the Habsburgs. Frederick’s son Maximilian (r. 1493–1519) succeeded his father, controlling vast territories. He inherited the Free County of Burgundy from his father-in-law, Charles the Bald, together with some parts of the Low Countries. In 1490 he acquired Tyrol and parts of Austria from his half-uncle, Sigismund, son of Frederick IV of Austria. Maximilian’s rule over the Free County of Burgundy provoked tensions with the French Crown, which led to the Italian Wars (1494–1559). In 1499 Maximilian’s army was badly beaten by the Swiss Confederation, resulting in the imperial recognition of the Swiss independence. His grandson, Charles V of Spain, succeeded Maximilian. During his reign (1519–56), the Habsburg house rose to the premier authority and influence in Europe, holding dominions in the central Europe, Germany, the Low Countries, parts of Burgundy, and Spain with its vast American colonies. After his death, the Habsburg holdings were divided among his heirs. The Habsburg dynasty ruled Spain until the death of Charles II in 1700, while the Austrian lineage did not cease until 1918, when the last emperor Karl, or Charles, resigned and Austria was proclaimed a republic.